Want to send messages to a channel of people rather than an individual? Here's how to do it. Read more about creating and editing messages in a template. When creating a new message, you'll now have the option to have Donut post in a channel (messages will be visible to all members of that channel) rather than only to individual recipients or in a DM. Posting to channels is a great option for general announcements that you wish to be seen by many team members at once. Go to the Templates tab and select the Template you want to add a channel message to. Once you're in the template, hit "Add Message" on the date you'd like a message to send to get started. Under "Who's it for?" select the option that says "Channel" and search available channels for the name of the channel which you'd like your message to post. Under "When is it for?" select the time of day you'd like the message to send. 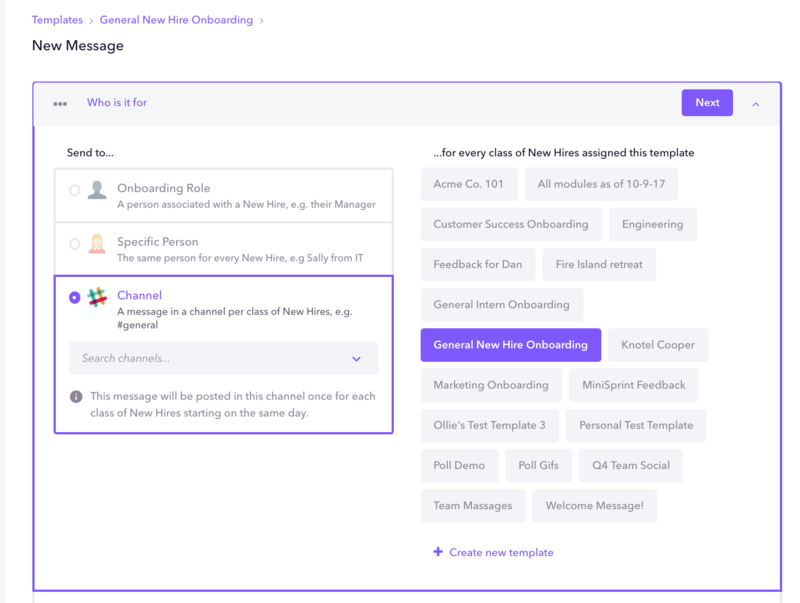 Write the message you want to post in channel inside the purple text box. You can include information, tips, links, or anything else in the text box. Hit "Create" to save your updates.